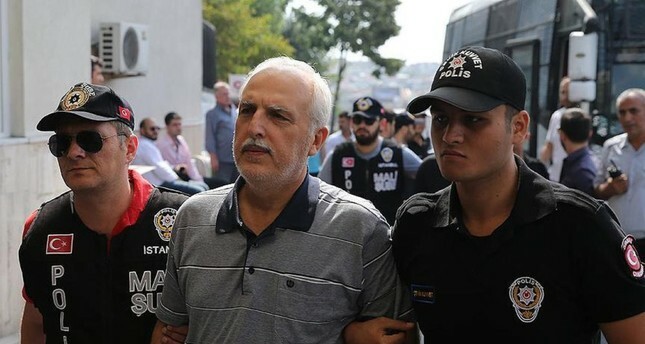 Mutlu, seen here in the company of police officers escorting him to a previous trial in Istanbul, will serve time in a prison where Selahattin Demirtaş, jailed head of a PKK-linked party and Adnan Oktar, head of a criminal cult, are being held. Hüseyin Avni Mutlu, the former governor of Istanbul whose sentence was upheld by a court over helping the Gülenist Terror Group (FETÖ), turned himself in and started his three-year sentence yesterday. Mutlu, who was among defendants accused of being one of FETÖ's infiltrators in governors' offices, was sentenced in February for aiding the terrorist organization "intentionally" though it ruled out that the governor was an active member of the group that is blamed for July 15, 2016 coup attempt. Accompanied by his lawyer, Mutlu arrived at a prison in Edirne, a city west of Istanbul, where he will serve his sentence after a higher court upheld his sentence. Mutlu, who was detained after the 2016 coup attempt, initially faced charges of membership in a terrorist group and attempting to overthrow Turkey's government. Mutlu served as governor of Istanbul from 2010 to 2014, after which he took a post with the Interior Ministry as a civilian authority. Police operations targeting the military in 2010 with the "Sledgehammer" ("Balyoz") coup plot allegations and government officials in Dec. 17 and 25, 2013, were conducted during Mutlu's term. Both cases were launched by police officers and prosecutors linked to FETÖ. Sentences given to active and retired military officers using fake or illegally gathered evidence were overruled by the Constitutional Court in the Sledgehammer case, while a retrial ruled for the acquittal of all suspects. The Gezi Park protests, which started as a small environmental protest in Istanbul's Taksim Square before turning into nationwide violent riots following heavy police crackdown, also took place during Mutlu's term in Istanbul.